Kids art kits and project kits define what this item is, and how kids can decorate the house of their dreams. 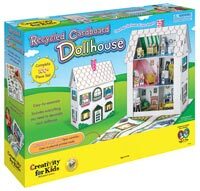 The childrens kit features a sturdy dollhouse made of recycled corrugated cardboard dollhouse. We call if the recycled dollhouse kit. It also includes markers, sticker accessories, punch-out dolls and easy-to-assemble furniture. Kids can use the supplies in the kit or go "green" and turn every day items into awesome accessories. Completed dollhouse measures 21" x 17.25" x 9". A fully illustrated guide is also included. For ages 4 and up.